Buffleheads have a woodpecker and boreal forest connection. Buffleheads nest almost exclusively in cavities excavated by Northern Flickers and Pileated Woodpeckers. 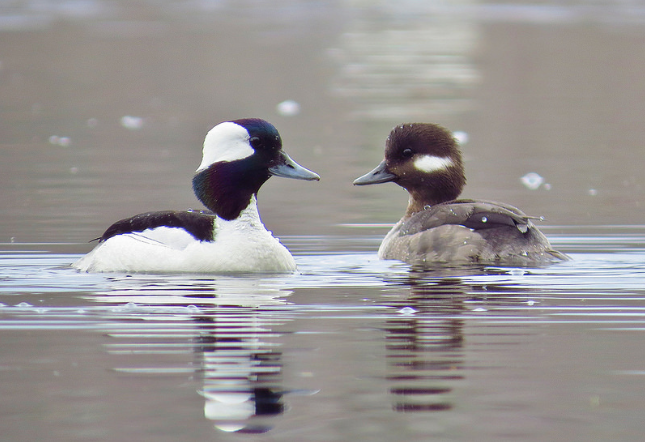 The breeding range of the Bufflehead is restricted to the woodlands of North America. The vast majority of Buffleheads breed in boreal forests with substrates studded with aspen. It’s Butterballs’ diving that forces me to stop and linger, to observe for understanding. I watch the thrusts, leaps, propulsion and buoyancy. Their plumage is pulled tight into their body; then, with a thrust of power and a slight, forward, nearly upward leap, they plunge. Their pink legs and feet force this propulsion. Upon surfacing, they bob cork-like on the surface like a tiny toy used to lure a reluctant toddler to its evening bath. Buffleheads are one of the fastest waterfowl and are easily recognized by their small size, large head and flight cadence. They’re the smallest of the diving ducks native to North America. They are sexually dimorphic both in plumage and in size. Drakes just exceed a pound in weight, and the hen, even smaller, weighs in at three-quarters of a pound. They’re agile swimmers and divers. On land, they’re awkward with legs set well back on their bodies. I’ll never tire of these buoyant, petite ducks ~ the ones that fly low over water and then higher over land. These black and white ducks are fast in flight with rapid wing beats without even a whistle. They are one of the fastest waterfowl and are easily recognized by their small size, large head and flight cadence. While a flock is diving for food, there’s almost always at least one sentinel on the surface alert to danger. I see them divide their time between shallow dives and rest periods on the surface. I’ve timed their dives ~ they stay under 10 – 14 seconds. After the dive, they surface, and their bills are prey-less since they consume their prey while underwater. On freshwater, they eat mostly insects, and in waters of salinity, they feed predominantly on crustaceans and mollusks. Aquatic plants and fish eggs are often on the menu too. Once during the shorter, harsher days of winter, I saw some foraging even after dark.